The Strawberry Festival at Triple B has their final weekend this Friday & Saturday! 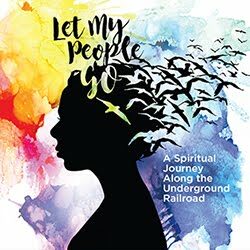 See all the info for the weekend happenings here. Although a frustrating morning finding our way to the farm, our trip to Triple B Farm was delightful, yummy and well worth it! Our troubles were in part due to wacky directions from Google Maps, unmarked roads and inconsistent signage. The rest of our troubles sat in my back seat, as my 2 and 4 year olds had a few disagreements. The final few miles approaching the farm calmed me as we drove along the railroad tracks and through lush green wooded land. Parking was easy and convenient and it was apparent where we were to go. 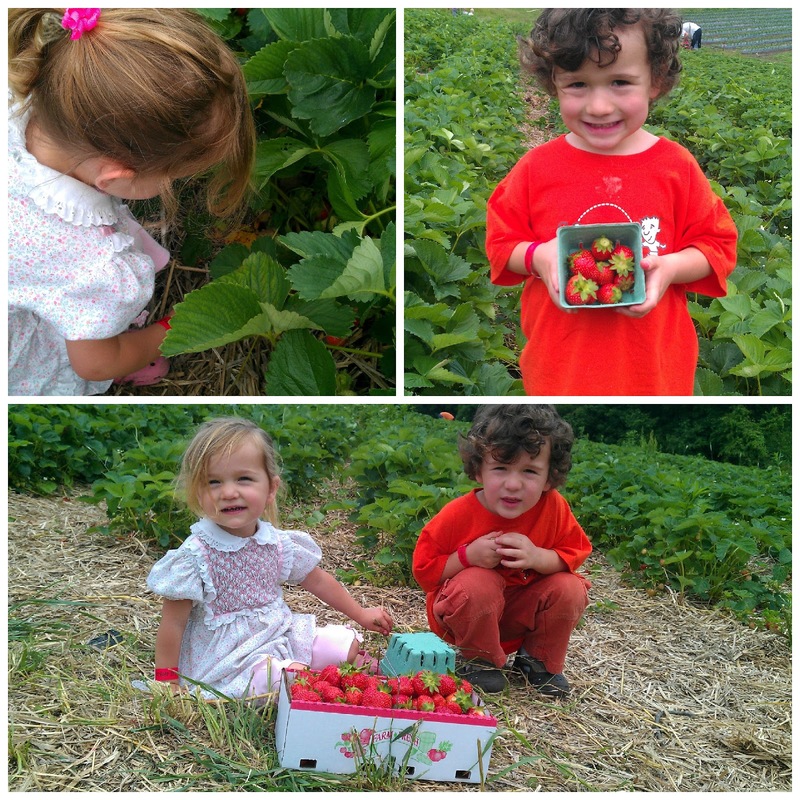 We decided to pick strawberries first and try out all the play areas once our work was complete. The kids were offered smaller pints to pick into, which proved to be perfect as the larger box that they provided for me eventually became to heavy for them to safely carry. Just yards away from picking up our boxes we climbed onto a hay wagon that took us to the strawberry fields. 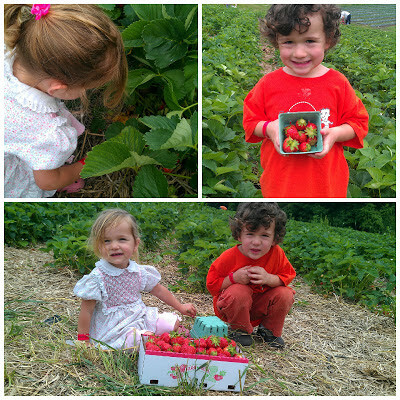 It quickly became apparent that they had multiple strawberry fields as our wagon passed by a group people picking. We also saw the fields/orchards for various other fruits and I pointed them out so that my kids could see the way that different fruits grow. The tractor pulled up to the field at which we were to pick and as we exited the wagon a young lady employee of the farm directed to the area of the field that was least picked. Straw was laid between the rows of plants so that we did not have to deal with dirt or mud and the rows were wide enough for even my two year old to walk the field without crushing the berries. As we walked to where the young lady had directed us, I noticed that there were still many ripe berries where the fields had already been picked and that there was plenty of fruit for all. The individual pints provided to my kids allowed them to be independent in the field and where my 2 year old daughter stayed fairly close to me, I would hear "Mommy, there are lots of ripe ones over here!" from my son who was 30 yards away. As the kids would fill their pints they would bring them to my box, empty them and get right back to picking. When our box was just about full they both said they were ready to get back on the wagon... for us, the box was perfect! However, I saw both families with six full boxes, who, I found out, froze the berries so that they had good fruit through the winter, as well as families whose strawberries barely covered the bottom of their box and had just come for the experience and so their kids could get a glimpse of what goes into getting food to our tables. After paying for our berries back at the weigh station, it was time to play! Each play area had a few options, which kept my very different kids occupied. 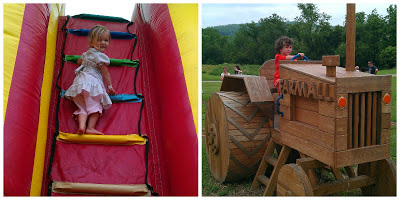 My 4 year old pretended to drive the wooden and real farm vehicles while my 2 year old made about a dozen runs through the blow-up obstacle course/slide. They were in a close enough area that I could keep an eye on both of them. Then we made our way to the unique slides that tunnel through a hill side and boy are they fast. Of course, my 2 year old was all about the speedy slides and even went on her own, while my son pumped water from an old-fashioned pump to make rubber duckies race at the bottom of the hill. After all of this playing we stopped in the food barn for lunch. The kids had the farm kids meal, which refueled them for some farm animal time. After lunch, we fed and petted some farm animals and learned about bees at a bee display. Alas, nap time approached and it was time to go, but boy, was I glad that I stuck to the plan and did not let the frustrating trip there turn me away (I almost turned around a few times on the way there.) We will definitely be heading back to Triple B... if not this weekend for weekend two of the strawberry festival then definitely for the next fruit that is in season! Thanks Triple B for a lovely day, quality fruit (which disappeared within two days) and for helping me to teach my children where their food comes from and a little of what goes into getting it to our table at mealtime!